Today, photographers, artists and creative agencies working in visual mediums need to make sure that their work and their web presence will impress potential clients across a variety of mobile, high-resolution devices. In this Siteturner round-up, we look at some of the best mobile & retina-ready WordPress photography themes. All themes in this round-up were selected by hand, and our choices are primarily based on design (both visual and UX). Sometimes features influence our decision: support for the WooCommerce plugin, for example. For this article, we first assembled a longer list of 40+ themes, and whittled it down to the cream of the crop. If you can’t find what you’re looking for in this round-up, be sure to check out our related articles, the Best Portfolio WordPress Themes for Artists, Freelancers and Agencies and the Biggest & Best Multipurpose WordPress Themes. The newest addition to our list, simply titled Photography, is really more of a 24-in-one kinda deal, and it gives you a lot of variation to work with. Twenty-four distinct, easy to install (read: one-click) demos are provided, with 70+ portfoio layouts to choose from. I mean, come on, that’s a lot of portfolio layouts, right? Along with the portfolio and photo-oriented features, everything you’d expect from a modern WordPress theme is baked in: it’s responsive, retain-ready for high resolution, extremely customizable (with WordPress’s Live Customizer integration for real-time previewing). As a bonus, the premium plugins iLightbox and Revolution Slider are bundled free. It’s probably worth taking a quick look at the demos to see the variety of styles/layouts included, and to get a better idea of everything this theme has to offer. Highly recommended, yo. Next, we’ve got Black Diamond. 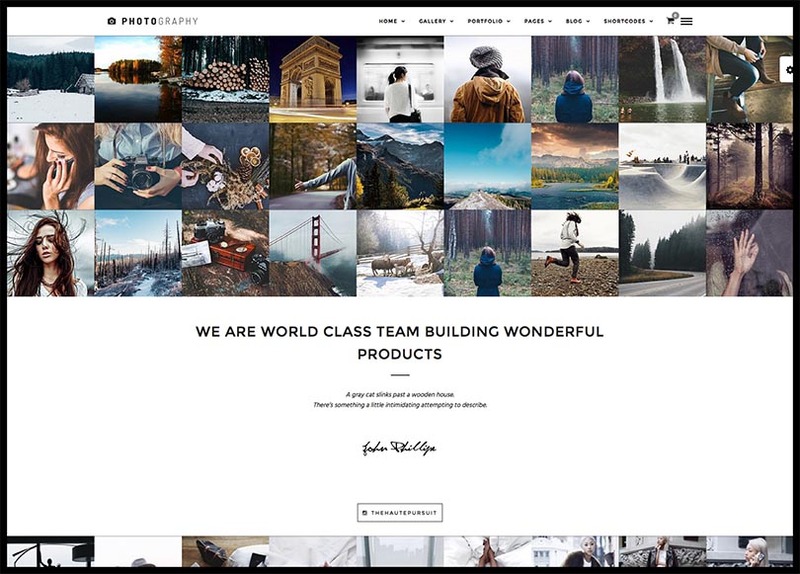 In addition to being fully mobile and retina-ready, this WordPress photography theme features a fullscreen homepage slider (supporting both images and vido), top-notch album and gallery integration, and a portfolio with a masonry-style layout. A ribbon-style gallery is also included, and a fullscreen blog rounds out the features. A drag & drop page builder is built-in, and the advanced options panel gives you plenty of control over the themes various elements, fonts, and colors. Stellar is a high-resolution photography theme for WordPress that comes with two predefined skins, light & dark, and features a unique gallery/archive page to display your work. The theme is built horizontally, to mimic the way a client might view a photobook. 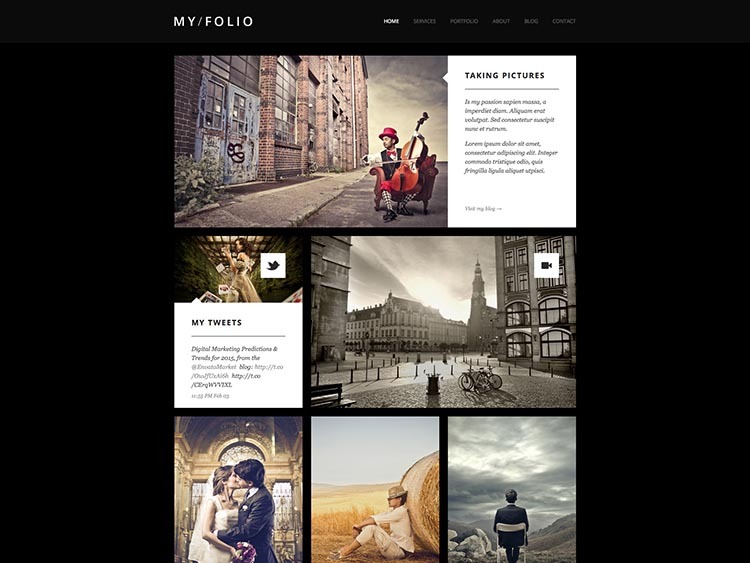 The theme is easy to customize, and includes lots of layout variations for your portfolio. Facebook, Twitter and Google+ are integrated, the Stellar is translation ready (with WPML support). The minimal, elegant Vega theme is one of our favorites. Elements like the parallax header background and fullscreen templates add visual flare, and the theme includes a useful drag & drop content builder for assembling and editing layouts. The popular premium plugin Revolution Slider is bundled for free. Next up, we have Camera7. This minimal, expertly designed theme boasts some tasteful, subtle visual effects that will make a lasting impression on site visitors, and it’s easy to use and manage on the backend for site admins. A variety of layouts are included to choose from and unlimited colors are available. The minimal, simply-titled Photographer theme is a brand new theme not to be underestimated. This highly mobile, retina-ready theme is the perfect way to showcase your portfolio, with its focus on content and user experience. Extraneous bells & whistles are eliminated in favor of a distraction free experience. Easy to use, easy to customize, and SEO and translation-ready. Frame is another WordPress photography theme that takes full advantage of full-screen style. The modern, flat design provides an air of professionalism and class, and the theme comes in two flavors: dark and light. A masonry porfolio/gallery is included. Lots of options are available in the extended options panel for customization. 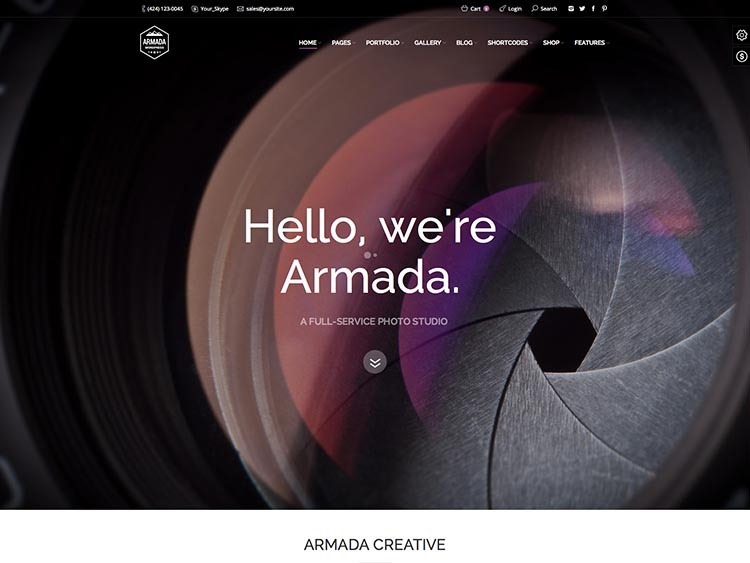 The massive Armada theme brings you a ton of flexibility along with its contemporary, professional design. Clean lines, white space and tasteful typography make Armada a standout, and an endless amount of layout options and theme are at your disposal. The theme also comes bundled with Visual Composer, Slider Revolution, and the premium Pricing plugin – all for free. 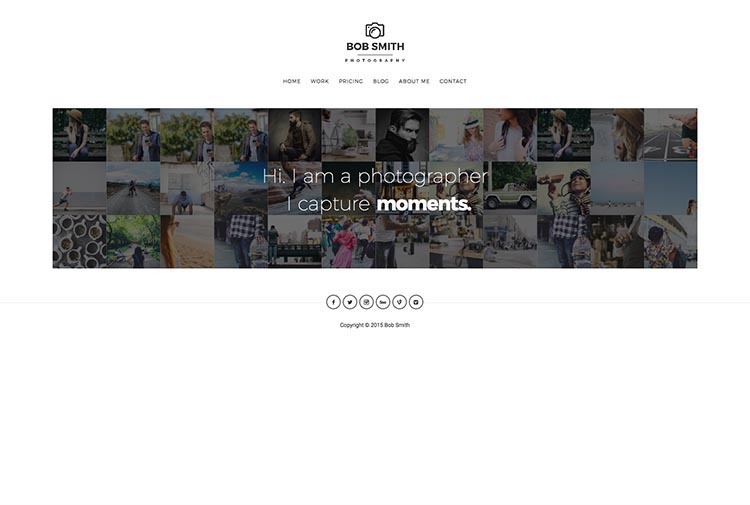 Another older release, mobile and retina-ready Tripod theme could have just has easily been released last week – its timeless, minimal design makes it a great option for independent photographers who want their work front and center. A drag & drop layout builder is included, adding flexibility, and multiple gallery options are built-in. 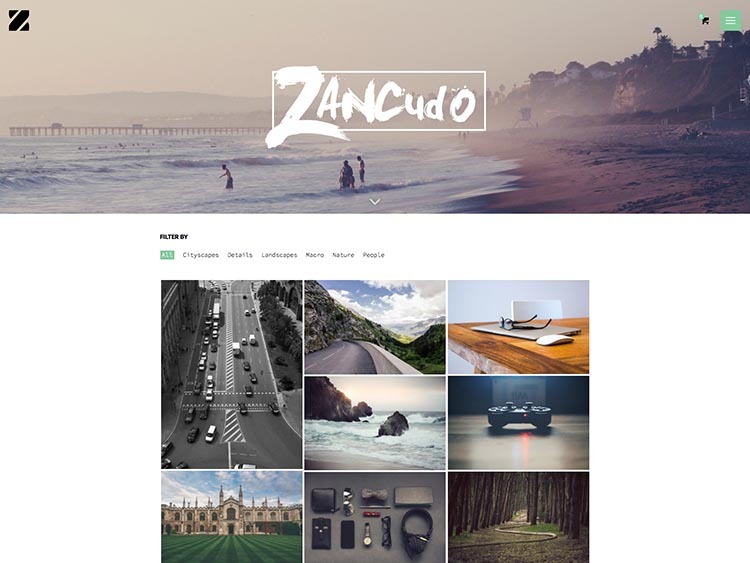 Simple and straight-to-the-point, the retina-ready WordPress photography theme Zanduco gives you two menu styles to choose from, three header layouts, and a built-in parallax slideshow on every page. The portfolio is smartly integrated, give you several ways to layout and display your work. WooCommerce is integrated with this one, too! Galanty is fullscreen photography theme that needs to be seen up close to be fully appreciated, thanks to the pretty-nifty menu to the right. Be sure to check out the demo to see what we mean. We tried to get a screen capture of it for our screenshot, but couldn’t quite manage it. Beyond the sweet design, this fast theme comes with features like Visual Composer for drag & drop page building, WooCommerce support, and a huge options panel that will allow you to tweak everything you see. 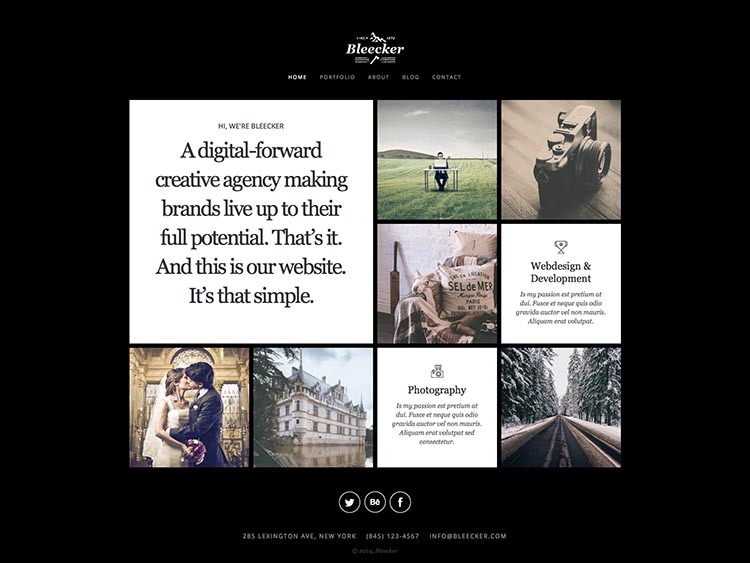 Bleeker is a simple, content-focused theme with a high-contrast, eye-popping visual design and fantastic UX design (user experience), in part due to the AJAX navigation that eliminates page loads. This mobile, retina-ready WordPress theme couldn’t be easier to install and use. Touch optimized, and an excellent choice for independent photographers and other creative designers. DeRailed is multipurpose theme that, while not explicitly intended for showing off photography, is definitely qualified to the job. It’s perhaps not the best match for agencies, but WooCommerce is supported, and worth a look for independents and hobbyists. Finally, for your consideration, we have My Folio, another minimalistic portfolio theme like Bleeker, above. A breeze to use, My Folio comes packaged with a simple drag & drop page builder and unlimited color schemes to choose from. The AJAX loading eliminates the need for page reloads, ensuring a seamless and enjoyable user experience. 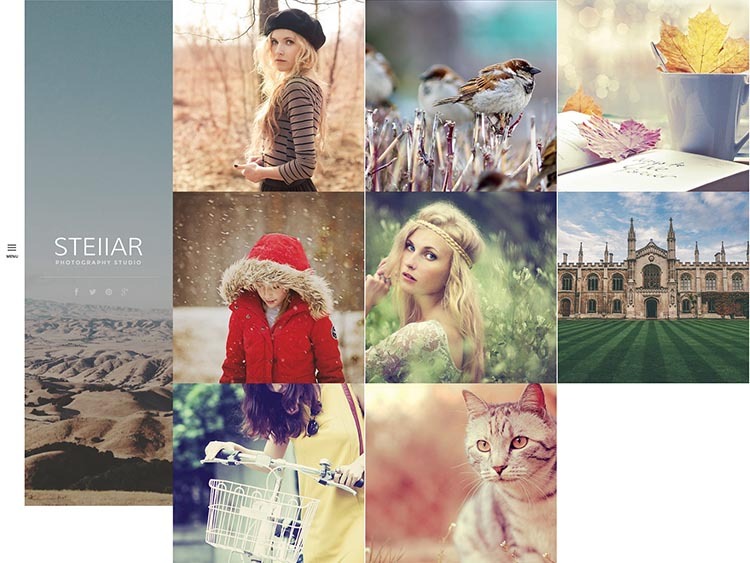 And that concludes our look at the best mobile & retina-ready WordPress Photography Themes. Come back next time, when we’ll be looking at a different type of WordPress theme. Probably something to do with parallax scrolling. Or sports! Who knows.